House Ear Institute-Organ of Corti 1 (HEI-OC1) is one of the few mouse auditory cell lines currently available for research purposes. This protocol describes how to work with HEI-OC1 cells to investigate the cytotoxic effects of pharmacological drugs as well as functional properties of inner ear proteins. Kalinec, G. M., Park, C., Thein, P., Kalinec, F. Working with Auditory HEI-OC1 Cells. J. Vis. Exp. (115), e54425, doi:10.3791/54425 (2016). HEI-OC1 is one of the few mouse auditory cell lines available for research purposes. Originally proposed as an in vitro system for screening of ototoxic drugs, these cells have been used to investigate drug-activated apoptotic pathways, autophagy, senescence, mechanism of cell protection, inflammatory responses, cell differentiation, genetic and epigenetic effects of pharmacological drugs, effects of hypoxia, oxidative and endoplasmic reticulum stress, and expression of molecular channels and receptors. Among other several important markers of cochlear hair cells, HEI-OC1 cells endogenously express prestin, the paradigmatic motor protein of outer hair cells. Thus, they can be very useful to elucidate novel functional aspects of this important auditory protein. HEI-OC1 cells are very robust, and their culture usually does not present big complications. However, they require some special conditions such as avoiding the use of common anti-bacterial cocktails containing streptomycin or other antibiotics as well as incubation at 33 °C to stimulate cell proliferation and incubation at 39 °C to trigger cell differentiation. Here, we describe how to culture HEI-OC1 cells and how to use them in some typical assays, such as cell proliferation, viability, death, autophagy and senescence, as well as how to perform patch-clamp and non-linear capacitance measurements. House Ear Institute-Organ of Corti 1 (HEI-OC1) cells are derived from the auditory organ of a transgenic mouse 1,2. Incubation of any cell from this transgenic mouse at 33 °C/10% CO2 (permissive conditions) induces expression of an immortalizing gene that triggers de-differentiation and accelerated proliferation; moving the cells to 39 °C/5% CO2 (non-permissive conditions) lead to decreased proliferation, differentiation and, at least in the case of HEI-OC1, cell death 2,3. HEI-OC1 cells were cloned and characterized in our laboratory over a decade ago, and initial studies indicated that they express specific markers of cochlear hair cells, such as prestin, myosin 7a, Atoh1, BDNF, calbindin and calmodulin, but also markers of supporting cells like connexin 26 and fibroblast growth factor receptor (FGF-R) 2. Therefore, it was suggested that HEI-OC1 could represent a common progenitor for sensory and supporting cells of the organ of Corti 2. Parallel studies provided strong evidence that archetypal ototoxic drugs like cisplatin, gentamicin and streptomycin induced caspase-3 activation in these cells, while drugs considered non-ototoxic, like penicillin, did not 2,3. Therefore, this cell line was proposed as an in vitro system to investigate the cellular and molecular mechanisms involved in ototoxicity and for screening of the potential ototoxicity or otoprotective properties of new pharmacological drugs. It is estimated that HEI-OC1 cells have been used in more than one hundred and fifty studies published in the last ten years. Whereas looking at the potential pro-apoptotic effect of different drugs was the major goal of most of the studies involving this cell line, other important cell processes like autophagy and senescence have just started to be investigated in HEI-OC1 cells4-7. In a recent study from our laboratory 8, we used HEI-OC1 cells to collect a comprehensive set of data about cell death, survival, proliferation, senescence and autophagy induced by different pharmacological drugs frequently used in the clinic. We also compared some of the responses of HEI-OC1 cells with those from HEK-293 (human embryonic kidney cells) and HeLa (human epithelial cells) receiving identical treatment. Our results indicated that HEI-OC1 cells respond to the each drug in a characteristic way, with a distinctive dose- and time-dependent sensitivity to at least one of the mechanisms under study. We also emphasized in that study that a correct interpretation of the experimental results will require performing parallel studies with more than one technique 8. In a different study we investigated the use of HEI-OC1 cells to evaluate the functional response of prestin, the motor protein of cochlear outer hair cells (OHCs) 9. We reported flow cytometry and confocal laser scanning microscopy studies on the pattern of prestin expression, as well as nonlinear capacitance (NLC) and whole cell-patch clamping studies in HEI-OC1 cells cultured at permissive (P-HEI-OC1) and non-permissive (NP-HEI-OC1) conditions. Our results indicated that both total prestin expression and plasma membrane localization increase in a time-dependent manner in NP-HEI-OC1 cells. Interestingly, we also found that the increase in prestin localization at the plasma membrane of NP-HEI-OC1 cells correlated with a decrease in Na+K+ATPase, which translocated from the plasma membrane to the cytoplasm without significant changes in total cell expression. In addition, we demonstrated that P-HEI-OC1 cells have a robust NLC associated to prestin motor function, which decreased when the density of prestin molecules present at the plasma membrane increased. Altogether, these results strongly support the usefulness of HEI-OC1 cells to investigate auditory proteins. In this video article we describe how to culture HEI-OC1 cells, why it is convenient to use cells growing at permissive conditions (P-HEI-OC1) for cytotoxicity studies, how to evaluate the mechanism/s of drug-induced cytotoxicity and how to perform electrophysiological studies (e.g., patch-clamp, non-linear capacitance (NLC)) to investigate functional properties of prestin, the molecular motor of cochlear OHCs. Note: All cell culturing protocols must be performed using proper cell culture techniques (for reference see the first 3 Chapters of Cell Biology: A Laboratory Handbook, Volume I 10). HEI-OC1 cells do not require any additional coating or treatment of the cell culture dishes for proper adherence and growth. Very important: do not use glassware dishes for cell culture purposes; the phenotype and biological response of the cells to pharmacological drugs will change (G Kalinec & F Kalinec, unpublished); conventional plastic cell culture dishes are recommended (see Table of Materials/Equipment). Pay special attention to aseptic techniques to avoid contaminations, but never use antibiotics (e.g., ampicillin or streptomycin) with HEI-OC1 cells. If necessary, use amphotericin B. While HeLa and HEK-293 cells have been used as control in previous studies with HEI-OC1 8, any other cell line could be acceptable for this purpose. Note: This protocol can also be used with other cell lines from the same transgenic mouse developed in our laboratory, such as OC-k3, from organ of Corti 11,12, and SV-k1, from stria vascularis 13,14. Remove a vial of cryopreserved HEI-OC1 cells from liquid N2, and place it in a water bath at 37 °C. Submerge only the lower half of the vial, and allow it to thaw until only a small amount of ice remains in the vial. Wipe the outside of the vial with 70% alcohol. Pipette the cells from the vial and deliver the entire volume (~ 1.5 x 105 cells/ml) slowly, drop by drop, into a 15 ml conical tube containing 10 ml of a pre-warmed growth medium, like Dulbecco's Modified Eagle's Medium (DMEM), supplemented with 10% fetal bovine serum (FBS). Remove DMSO by centrifuging the tube at 300-500 x g for 5 min, discarding the supernatant and re-suspending the cells in 9 ml of fresh growth medium (DMEM + 10% FBS). Disaggregate clumps or sheets of cells by flux and reflux of the suspended cells, from the pipette to the medium and vice-versa, three to four times with the tip of the pipette touching the bottom of the tube. Place the total volume of cells suspended in growth medium in 100 mm-diameter untreated, plastic cell culture dishes. Incubate the cells at 33 °C with 10% CO2 (permissive conditions). Note: Prior to confluence (~80%) the cells should be brought into suspension and sub-cultured in order to prevent the culture dying. This protocol can also be used with other cell lines developed in our laboratory from the same transgenic mouse, such as OC-k3, from organ of Corti 11,12, and SV-k1, from stria vascularis 13,14. Remove old medium and wash the cells with 2 ml of PBS. Cover the cell monolayer with a solution of 0.25% trypsin, using 1 ml per 25 cm2 of surface area. To move onto the next step more than 40% of the cells must be detached. Examine the cells using an inverted microscope and, if necessary, "slap or tap" the culture dishes gently to release any remaining attached cells. Note: Take care as trypsinization for long periods can cause cell death; not enough and the transferred cells will insufficient for the planned studies. Resuspend the cells, following the procedure described in 1.1.3, and transfer them to a 15 ml conical tube. Centrifuge for 5 min at 300-500 x g, discard the medium, collect the cells with fresh growth medium and seed them in, at least, four 100 mm-diameter cell culture dishes. The number of cells per dish will depend on the amount of cells recovered. Incubate the cells at 33 °C with 10% CO2 (P-HEI-OC1) and divide again as many times as necessary for the planned experiments or for generating a new stock. For stock preparation, replace 100 mm-diameter dishes by 250-550 ml cell culture flasks; for experiments, smaller dishes or multi-wells plates may be more adequate. For differentiation, incubate HEI-OC1 cells at permissive conditions until they reach ~80% confluence; then move the dishes to 39 °C with 5% CO2 (NP-HEI-OC1) for 2 to 3 weeks. Note: Cells will progressively stop proliferating and dying. Change the medium every other day to remove dead cells. Depending on the original number of cells, usually after ~ 4 weeks no more cells will be available for experiments. Differentiation starts as soon as the cells are placed at NP conditions, but not every cell differentiate at the same pace. Importantly, prestin expression and membrane localization increases during the differentiation process (see Representative Results, Figure 4), providing a qualitative and quantitative indication of the level of differentiation. Note: HEI-OC1 cells grown at permissive conditions (P-HEI-OC1) are recommended for these studies (see Representative Results, Figure 1). Collect P-HEI-OC1 cells by following the procedure described in 1.2, and count them with either an automatic cell counter or hemocytometer. Adjust the concentration to 2.0 x 105 cells/ml. Seed the cells on 96-well clear flat bottom plates (100 µl per well), incubate overnight for attachment to the substrate, and then treat them with the drugs of interest. Do not forget to include blanks and non-treated cells (control)! Add 10 µl of MTT reagent to each well. Incubate the plate at 37 °C for 2 to 4 hr until purple dye is visible, and then add 100 µl of the MTT Detergent Reagent to each well. Do not shake the plate. Cover the plate and leave it in the dark for 2 to 4 hr at 37 °C. Use a microplate plate reader to measure absorbance at 570 nm in each well, including the blanks (growth medium alone). Normalize data using the average OD in control cells as 100% of viability. Note: HEI-OC1 cells grown at permissive conditions (P-HEI-OC1) are recommended for these studies. Collect HEI-OC1 cells by following the procedure described in 1.2, and count them with either an automatic cell counter or a hemocytometer. Adjust the concentration to 2.0 x 105 cells/ml. Seed the cells on white-walled 96-well plates (100 µl per well), incubate overnight for attachment to the substrate, and then treat them with the drugs of interest. Do not forget to include blanks and non-treated cells (control)! Prepare the reagents, mix them well, and allow them to equilibrate to room temperature. Remove the cells from the incubator and allow the plates to equilibrate to room temperature. Add the indicated amount of reagent to each well, being careful to avoid cross-contamination by not touching wells containing different samples with the same pipette tips. Cover the plate and mix for 30 sec using a plate shaker at 300-500 rpm. Incubate the plate at room temperature for a period of, at least, 30 min. Determine the optimal incubation period empirically. If the room temperature fluctuates use a constant-temperature incubator, because temperature fluctuations will affect luminescence reading. Measure luminescence in each well, and normalize values using average luminescence in control cells as 100% of caspase activation. Seed the cells on 96-well clear flat bottom plates (100 µl per well), incubate overnight at permissive conditions for attachment to the substrate, and then treat them with the drugs of interest. Don't forget to include blanks and non-treated cells (control)! One hour after treatment, add to each well 1 µl of prepared 100x BrdU (5-Bromo-2′-deoxyuridine) solution, and return the plates to the incubator at 33 °C. After 12, 24 and 48 hr, remove the existing medium from the corresponding plates and wash each well once with PBS. Prepare the reagents, including fixing/denaturing solution, wash buffer, primary antibody detection solution, secondary antibody detection solution, and BrdU solution as indicated in the manufacturer's protocol. Add the fixing/denaturing solution to each well, in the amounts indicated in the manufacturer's protocol, and keep the plate at room temperature for 30 min. Remove the fixing/denaturing solution and add the primary antibody at the concentration indicated in the manufacturer's protocol. Keep the plate at room temperature for 1 hr. Remove the solution with the primary antibody, wash the plate 3 times with wash buffer, and then add the secondary antibody at the concentration indicated in the manufacturer's protocol. Keep the plate with the secondary antibody at room temperature for 30 min. Remove the solution with the secondary antibody, wash the plate 3 times with wash buffer, and add the substrate. After 10 min incubation at room temperature, add the STOP solution. Be careful: Control the change in color; if the solution becomes very dark, stop the reaction prior to the standard development time of 10 min. Read absorbance at 450 nm within 30 min of adding the STOP Solution. Incubate at permissive conditions, usually for 24-48 hr, HEI-OC1 cells in cell culture medium alone (control) or medium plus the drugs of interest. At the end of the treatment, wash the cells three times with PBS, and detach using 1 ml per 25 cm2 of surface area of a non-enzymatic cell dissociation solution for 3 min. After detaching, collect and pellet the cells by centrifugation at 3,000 x g for 5 min, remove the supernatant, and stain the cells for 15 min in the dark with the reagent included in cytotoxicity assay. Determine the number of live HEI-OC1 cells by flow cytometry as indicated by the manufacturer of the flow cytometer. At the end of the experimental treatments, wash the cells three times with PBS and then incubate them with 100 nM Bafilomycin A1 in cell culture medium for 1 hr at permissive conditions. Add C12FDG at a final concentration of ~33 µM, and continue incubating the cells for 1-2 hr. Wash the cells twice with PBS, harvest them using 1 ml per 25 cm2 of surface area of a non-enzymatic cell dissociation solution for 3 min, and pellet them by centrifugation at 3,000 x g for 5 min. Resuspend the cells in ice-cold PBS and determine the number of positive HEI-OC1 cells by flow cytometry as indicated by the manufacturer of the flow cytometer. Seed HEI-OC1 cells in 6-well plates at a concentration of 1.0 x 105 cells/ml. After 24 and/or 48 hr, wash the cells with ice-cold PBS. Lyse with 200 µl of TNESV buffer (1% NP40, 50 mM Tris-HCl pH 7.5, 100 mM NaCl, 2mM EDTA, 1 mM Na3VO4) with protease inhibitor cocktail and 1 mM PMSF for 5 min on ice. Collect the cells (by scraping the bottom of each well), transfer to microcentrifuge tubes and centrifuge at 16,800 x g for 5 min at 4 °C. Collect the supernatants and quantify the protein concentration using the BCA Assay. Add 5x loading buffer and 1 mM DTT to each sample and boil for 5 min to denature the proteins. Run the samples using SDS-PAGE on a 4-12% gel, and transfer to PVDF membranes. Block the membranes with 5% nonfat dried milk in TBS-T with 0.1% Tween 20 for 60 min at RT. Incubate the membranes overnight at 4 °C with primary antibodies. The next day, wash the membranes extensively with TBS-T, and incubate with a secondary IgG antibody conjugated to horseradish peroxidase (HRP) (1:1,500) for 1 hr. Detect immunoreactivity with an enhanced chemiluminescence (ECL) detection system. Normalize protein expression levels using GAPDH (1:2,000 in TBS-T with in 10% nonfat dried milk) as standard. In the Western blots investigate the expression of, at least, two different markers of autophagy such as Beclin-1 and LC3B (usually at 1:1,000 dilution in TBS-T with 2.5% BSA). Do not forget to look for a control of protein expression such as GAPDH or actin. Evaluate the expression of the protein of interest by densitometry using a digital Blot scanner or computer software such as the public domain NIH Image or ImageJ (http://rsb.info.nih.gov/nih-image/). Note: Use cells growing in 100 mm diameter culture dishes at 50%-80% confluency. Trypsin, Accutase, enzyme-free solution, or phosphate- buffered saline + ethylene diamine tetra acetic acid (PBS-EDTA) may be used for lifting the cells without significant effects on the number and quality of the gigaseals. In some cases, however, trypsin treatment makes the cells more fragile. In these cases, allow the cells to recover for approximately 30 minutes before starting the experiments. Wash the cells twice with 10 ml PBS without Ca2+ and Mg2+. Add 2 ml of an enzyme-free detacher solution, such as non-enzymatic cell dissociation solution, and incubate the dishes for 3 min at 37 °C with 5% CO2. Use an inverted microscope to check the detachment of the cells. If necessary, move the cell culture dish to detach more cells, but do it gently. Note: Do not shake the dish. Add 10 ml of DMEM+10% FBS and pipette the cells gently up and down five times with a 10-ml pipette. Look at the cells under a microscope. If > 80% of the cells are already separated (single), no further pipetting is needed. If the cells are still in clusters, repeat the gently pipetting until more than 80% cells are single. Place the ~10 ml of suspended cells into a 15 ml conical tube, centrifuge for 2 min at 100 x g, and discard the supernatant. Use ~200 µl of external recording solution (Leibovitz's L-15 medium adjusted to 305 - 310 mOsm with distilled water) to resuspend the cells. An optical control of the cells should show many single, round cells with smooth membrane edges. Perform patch-clamp and measurements of voltage-dependent nonlinear capacitance (NLC) using adequate amplifiers and software, as well as standard electrophysiological techniques. As internal (intrapipette) solution use 150 mM KCl, 1 mM MgCl2, 0.1 mM EGTA, 2 mM ATP-Mg, 0.1 mM GTP-Na, and 10 mM HEPES; adjust pH to 7.2 with Tris. Under the microscope, select a single, healthy cell, with round and smooth membrane edges. Attach the tip of the glass pipette to the cell surface and check membrane resistance. This should be around 3-6 megaOhms, corresponding to an internal diameter (ID) of the tip of the pipette of ~2 µm. Gently press the micropipette tip against the cell plasma membrane and then apply suction. A portion of the cell membrane will be suctioned into the pipette, generating an electrical resistance in the order of 10 - 100 gigaOhms (gigaseal). Establish the whole-cell condition by disrupting the plasma membrane with suction pulses. Use cells that do not express prestin, such as HEK-293, as a control 9. Note: Current responses should be filtered at 5 kHz, and corrections made for the effects of residual series resistance. All data collection and most analyses can be performed using the software usually included with the lock-in amplifiers. Capacitance function can be fitted to the first derivative of a two state Boltzmann function relating nonlinear charge to membrane voltage 16. In a couple of recent publications we reported a comprehensive set of studies aimed at evaluating the response of HEI-OC1 cells to several commonly used pharmacological drugs as well as investigating prestin function 8,9. In these studies we made use of all the protocols described in the previous sections. One of the results of these previous studies was that HEI-OC1 cells cultured at non-permissive conditions (39 °C/10% CO2 = NP-HEI-OC1) showed a highly significant decrease in cell viability, and an equally significant increase in cell death, respect to cells cultured at permissive conditions (33°C/10% CO2 = P-HEI-OC1) (Figure 1). Therefore, any cytotoxicity study performed on NP-HEI-OC1 cells should dedicate considerable efforts in discriminating drug effects from the effects of culture conditions. In addition, since drug effects on cells already dying or with a decreased viability could be different that the effects of the same drug on healthy cells, we recommend using P-HEI-OC1 cells for experiments that do not specifically require differentiated cells. Our studies on the effect of different pharmacological drugs also produced interesting results. For example, cisplatin, a chemotherapeutic agent frequently used for the treatment of several human malignancies, and acetaminophen (APAP = N-acetyl-para-aminophenol), the most widely sold over-the-counter painkiller in the USA, were both toxic for HEI-OC1 cells (Figure 2). However, while APAP decreased cell viability and increased caspase 3/7 activation, it did not induce cell death. Cisplatin, in contrast, significantly increased the three responses (Figure 2). Interestingly, caspases 3/7 were mostly activated at lower cisplatin concentrations, suggesting that cell death induced by low doses of cisplatin was probably mediated by apoptosis, while high doses lethal effects could be associated with oncosis/necroptosis. While oncosis has been defined as a pre-lethal pathway leading to unregulated cell death accompanied by cellular and organelle swelling, blebbing, and increased membrane permeability 17,18, necroptosis is a regulated non-apoptotic cell death mechanism activated by the same stimuli that initiate apoptosis but with morphological features similar to those of oncosis 19-22. Additional studies aimed at investigating the effects of APAP and cisplatin on P-HEI-OC1 cells showed a clear, dose-dependent effect of APAP on cell proliferation that could explain the intriguing decrease in cell viability without cell death described in the previous paragraph (Figure 3A). Cisplatin also decreased cell proliferation, and its effect augmented with time of exposure even for small doses (Figure 3A), but in addition decreased senescence at all the concentrations and time-points included in our study (Figure 3B). The significant decrease in cell senescence induced by cisplatin could be explained by the increase in cell death, assuming that senescent cells would be, probably, prone to die faster than healthy cells 23. Importantly, these representative results suggest that HEI-OC1 cells respond to different pharmacological drugs with a distinctive dose- and time-dependent sensitivity to at least one of the mechanisms under study. Therefore, a correct interpretation of any experimental result will require a clear understanding of the particular cellular processes investigated and the information provided by each one of the techniques used to evaluate them. Confocal and flow cytometry experiments, on the other hand, confirmed prestin expression in P-HEI-OC1 and NP-HEI-OC1 cells, with prestin immunolocalizing mostly at the cytoplasm of P-HEI-OC1 cells (Figure 4A, arrows), and more concentrated at the plasma membrane in NP-HEI-OC1 cells (Figure 4B, arrows). Flow cytometry studies showed a clear increase in prestin expression in NP-HEI-OC1 cells respect to P-HEI-OC1 cells (Figures 4C and 4D). The time-dependent increase in expression and plasma membrane localization of prestin in NP-HEI-OC1 cells suggests that translocation was accompanied by synthesis of more prestin molecules. However, these experiments did not provide clues to decide whether prestin molecules originally located in the cytoplasm move to the plasma membrane and new molecules replace them, if they remain at the cytoplasm and only the newly synthesized prestin moves to the plasma membrane, or a combination of both processes. Electrophysiological studies showed a robust NLC in P-HEI-OC1 cells (Figure 5B), with a peak value that decreased and a voltage at peak capacitance that shifted to more depolarized values, when the cells were moved to non-permissive conditions for 1 and 2 weeks (Figures 5C and 5D). 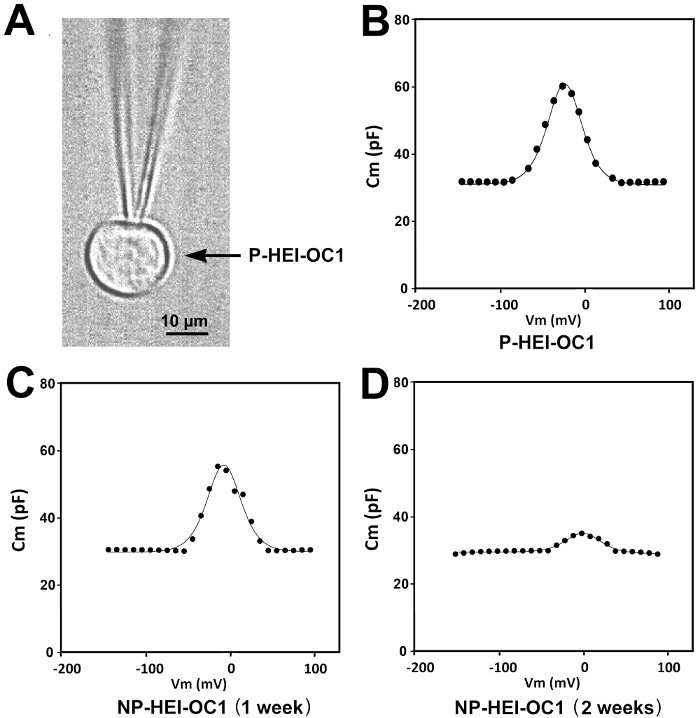 Because of the progressive translocation of prestin from the cytoplasm to the plasma membrane, we originally hypothesized that NLC would be higher in NP-HEI-OC1 than in P-HEI-OC1 cells, and that it would further increase with time of incubation at NP conditions. Surprisingly, the results of our studies showed exactly the opposite response. We speculated that the increase in the density of prestin molecules in the plasma membrane could be restricting their motor function. Note in Figure 5 the depolarization of the voltage at peak capacitance in HEI-OC1 cells respect to the typical values reported in OHCs and in transfected HEK293 cells 24; moreover, observe that the depolarizing shift increases with time at NP conditions. The progressive depolarizing shift is similar to that described in OHCs during mouse and rat development 25,26, and it had been suggested that it might be related to the development of other cellular structures associated with the OHC's plasma membrane 25, or a maturation process intrinsic to prestin 24. We hope this brief recount of a few studies with HEI-OC1 cells provide enough evidence of the potential usefulness of HEI-OC1 cells for investigating a wide spectrum of cell and molecular responses. Figure 1: Cell Viability and Cell Death in P-HEI-OC1 and NP-HEI-OC1 Cells. (A) Cell viability evaluated with the MTT assay. Absorbance was measured with a Plate Reader, and average OD in control cells was taken as 100% of viability. (B) Cell death evaluated with a Cytotoxicity Assay. The number of positive (dead) cells was determined by flow cytometry with 488 nm excitation (blue laser) and FL1: 530 15 nm. Note the highly significant (P ≤0.001) decrease in cell viability (A) and increase in cell death (B) induced by non-permissive conditions. Bars represent standard error of the means (SEM). Modified from reference 8. Please click here to view a larger version of this figure. Figure 2: Responses of HEI-OC1 Cells Exposed to APAP and Cisplatin when Analyzed by MTT, Caspases 3/7 and Cytotoxicity Assays. 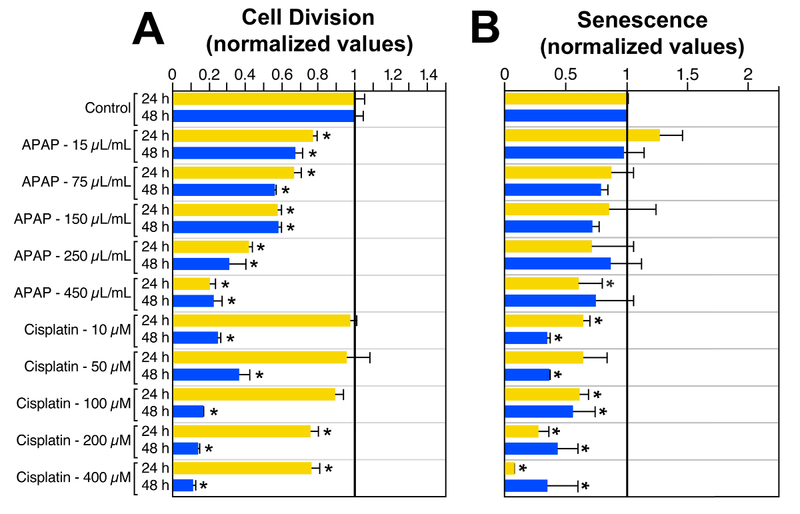 (A) Cell viability evaluated with the MTT assay, and absorbance measured with a Plate Reader. (B) Activation of executioner caspases 3/7. (C) Drug-induced cell death evaluated with a Cytotoxicity Assay; the number of positive (dead) cells was determined by flow cytometry. Data in every experiment was normalized to the respective control conditions (control = 1) to make possible simultaneous statistical analysis. * = P ≤0.05 respect to control. Bars represent standard error of the means (SEM). Modified fromreference 8. Please click here to view a larger version of this figure. Figure 3: Effects of APAP and Cisplatin on HEI-OC1 Cells' Mitotic Rate and Senescence. (A) Drug-induced changes on the rate of mitotic division of HEI-OC1 cells, at 24 and 48 hr, was evaluated with a BrdU Assay. (B) Drug-induced senescence in HEI-OC1 cells was measured by flow cytometry and the senescence-associated β-galactosidase (SA-Bgal) technique. Data in every experiment was normalized to the respective control conditions (control = 1) to make possible simultaneous statistical analysis. * = P ≤0.05 respect to control. Bars represent standard error of the means (SEM). Modified fromreference 8. Please click here to view a larger version of this figure. 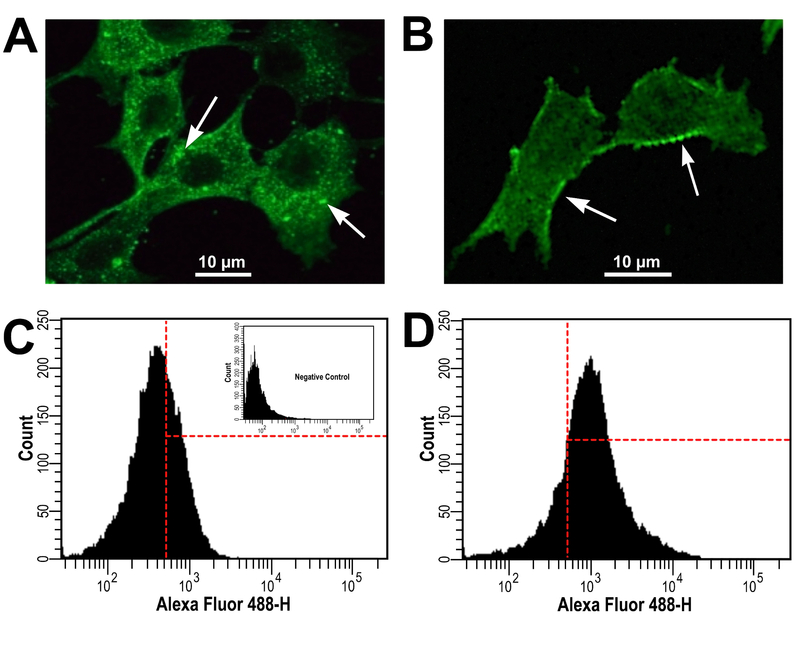 Figure 4: Prestin Expression in P-HEI-OC1 and NP-HEI-OC1 Cells - Cells were Labeled with Anti-Prestin Antibody and Observed by Confocal Microscopy and Flow Cytometry. (A) In P-HEI-OC1 cells prestin immunolocalized mostly at the cytoplasm (arrows). (B) In NP-HEI-OC1 cells, in contrast, prestin reactivity was concentrated at the plasma membrane (arrows). (C and D) Flow cytometry studies in HEI-OC1 cells cultured for 2 weeks at NP conditions (D) showed a clear increase in prestin expression respect to P-HEI-OC1 cells (C). (C) Inset is secondary ab only (negative control). Modified from reference 9. Please click here to view a larger version of this figure. Figure 5: NLC studies in P-HEI-OC1 and NP-HEI-OC1 Cells. (A) Patch-clamped HEI-OC1 cell. (B-D) NLC in P-HEI-OC1 and NP-HEI-OC1 cells. Note the decrease in the peak of NLC and the progressive shift of the curves to more depolarized values in NP-HEI-OC1 cells. Modified from reference 9. Please click here to view a larger version of this figure. In this report we describe how to culture HEI-OC1 cells and use them to evaluate mechanisms of drug-induced cytotoxicity and to investigate functional properties of prestin, the molecular motor of cochlear OHCs. The technical procedures, however, are general enough to be easily adapted to different studies. All the protocols described here require the correct use of well-established cell culture techniques 10. Just like with any other cell line, working with HEI-OC1 cells requires a properly equipped cell culture facility, with a certified biological safety cabinet, a refrigerated centrifuge, a water bath, and one inverted microscope for examination of cell cultures and for counting cells if using hemocytometric techniques. A unique requirement, however, is the availability of two humidified incubators, one set at 33 °C/10% CO2 for P-HEI-OC1 cells and other at 39 °C/5% CO2 for NP-HEI-OC1 cells. If the planned studies involve only P-HEI-OC1 cells, the second incubator can be set at 37 °C/5% CO2 for different assays. The use of plastic cell culture dishes is an important additional requisite for working with HEI-OC1 cells. In fact, HEI-OC1 cells are very robust and they will growth in different surfaces and under very different conditions. However, their phenotype and their response to drugs and other stimuli will strongly depend on the culture parameters (G Kalinec & F Kalinec, unpublished). As we argued in a previous paper 8, this plasticity of HEI-OC1 cells may be advantageously used to design novel experiments. For example, it is well known that the oxygen tension in the cochlear perilymph is much lower (~2 kPa) than in a typical incubator at sea level (~21.3 kPa) 27. Incubating HEI-OC1 cells at lower O2 concentrations will change their responses, perhaps making them a better model for auditory sensory cells. It should be emphasized that the described protocols for culture and subculture of HEI-OC1 cells can also be used with other auditory cell lines developed in our laboratory from the same transgenic mouse, such as OC-k3 from organ of Corti 11,12 and SV-k1 from stria vascularis 13,14. Moreover, these cell lines could be useful as control for HEI-OC1 cells in selected experiments. For example, we have recently used SV-k1 cells to demonstrate that the inversely proportional immunoreactivity to prestin and Na+K+ATPase antibodies at the plasma membrane of HEI-OC1 cells was cell type-dependent response rather than associated with the transgenic mouse from which these cells were derived 9. Other critical requirement for working with HEI-OC1 cells is the practice of appropriate aseptic techniques such as cleaning all work surfaces within the safety cabinet with 70% ethanol or isopropanol and the decontamination of any materials required for the procedures. However, while other mammalian cell lines are frequently protected against inadvertent bacterial contamination by using penicillin-streptomycin or other similar combinations, antibiotics must never be used with HEI-OC1 cells except if the purpose of the study is to investigate their effects. HEI-OC1 cells were generated in antibiotic-free conditions, and they must be avoided to reduce the emergence of antibiotic-resistant cells. Finally, we want to re-emphasize a point already mentioned several times in this report: the phenotype and the response of HEI-OC1 cells to drugs and other stimuli will strongly depend on the culture parameters. Therefore, it is very important that the laboratories working with HEI-OC1 cells use similar protocols and cell culture conditions in order to make their results truly comparable with those provided by other groups. In addition, it is very important to remember that the HEI-OC1 cell line is only a model, with all the limitations that a model has. Expecting that in vitro experiments with HEI-OC1 cells will provide data accurately representing the in vivo responses of real auditory sensory cells is unrealistic. However, we strongly believe the HEI-OC1 cell line is a useful model for investigating functional responses of auditory sensory cells and the screening of the potential ototoxicity of pharmacological drugs. The authors declare no existing or potential conflict of interest. This work was supported by NIH Grants R01-DC010146 and R01-DC010397. Its content is solely the responsibility of the authors and does not necessarily represent the official view of the National Institutes of Health. Waterbath Stovall HWB115 PRODUCT COULD BE USED. Jat, P. S., et al. Direct derivation of conditionally immortall cell lines from an H-2Kb-tsA58 transgenic mouse. Proc. Natl. Acad. Sci. 88, 5096-5100 (1991). Kalinec, G. M., Webster, P., Lim, D. J., Kalinec, F. A cochlear cell line as an in vitro system for drug ototoxicity screening. Audiol. Neurootol. 8, 177-189 (2003). Devarajan, P., et al. Cisplatin-induced apoptosis in auditory cells: role of death receptor and mitochondrial pathways. Hear Res. 174, 45-54 (2002). Chen, F. Q., Hill, K., Guan, Y. J., Schacht, J., Sha, S. H. Activation of apoptotic pathways in the absence of cell death in an inner-ear immortomouse cell line. Hear Res. 284, 33-41 (2012). Hayashi, K., et al. The autophagy pathway maintained signaling crosstalk with the Keap1-Nrf2 system through p62 in auditory cells under oxidative stress. Cell Signal. 27, 382-393 (2015). Tsuchihashi, N. A., et al. Autophagy through 4EBP1 and AMPK regulates oxidative stress-induced premature senescence in auditory cells. Oncotarget. 6, 3644-3655 (2015). Youn, C. K., Kim, J., Park, J. H., Do, N. Y., Cho, S. I. Role of autophagy in cisplatin-induced ototoxicity. Int J Pediatr Otorhinolaryngol. 79, 1814-1819 (2015). Kalinec, G., Thein, P., Park, C., Kalinec, F. HEI-OC1 cells as a model for investigating drug cytotoxicity. Hear Res. 335, 105-117 (2016). Park, C., Thein, P., Kalinec, G., Kalinec, F. HEI-OC1 cells as a model for investigating prestin function. Hear Res. 335, 9-17 (2016). Celis, J. E. Cell Biology: A Laboratory Handbook. 1, 3rd, Elsevier Academic Press. (2006). Bertolaso, L., et al. Apoptosis in the OC-k3 immortalized cell line treated with different agents. Audiology. 40, 327-335 (2001). Kalinec, F., Kalinec, G., Boukhvalova, M., Kachar, B. Establishment and characterization of conditionally immortalized organ of corti cell lines. Cell Biol Int. 23, 175-184 (1999). Belyantseva, I., Kalinec, G. M., Kalinec, F., Kachar, B. In vitro differentiation of two immortalized cell lines derived from the stria vascularis of a transgenic mouse. 21st Midwinter Meeting Association for Research in Otolaryngology. 620a, (1998). Gratton, M. A., Meehan, D. T., Smyth, B. J., Cosgrove, D. Strial marginal cells play a role in basement membrane homeostasis: in vitro and in vivo evidence. Hear Res. 163, 27-36 (2002). Santos-Sacchi, J. Reversible inhibition of voltage-dependent outer hair cell motility and capacitance. J. Neurosci. 11, 3096-3110 (1991). Fink, S. L., Cookson, B. T. Apoptosis, pyroptosis, and necrosis: mechanistic description of dead and dying eukaryotic cells. Infect Immun. 73, 1907-1916 (2005). Majno, G., Joris, I. Apoptosis, oncosis, and necrosis. An overview of cell death. Am J Pathol. 146, 3-15 (1995). Vanden Berghe, T., Linkermann, A., Jouan-Lanhouet, S., Walczak, H., Vandenabeele, P. Regulated necrosis: the expanding network of non-apoptotic cell death pathways. Nat Rev Mol Cell Biol. 15, 135-147 (2014). Sun, L., Wang, X. A new kind of cell suicide: mechanisms and functions of programmed necrosis. Trends Biochem Sci. 39, 587-593 (2014). Chan, F. K., Luz, N. F., Moriwaki, K. Programmed necrosis in the cross talk of cell death and inflammation. Annu Rev Immunol. 33, 79-106 (2015). Vercammen, D., et al. Dual signaling of the Fas receptor: initiation of both apoptotic and necrotic cell death pathways. J Exp Med. 188, 919-930 (1998). Campisi, J. Aging, cellular senescence, and cancer. Annu Rev Physiol. 75, 685-705 (2013). Bian, S., Koo, B. W., Kelleher, S., Santos-Sacchi, J., Navaratnam, D. S. A highly expressing Tet-inducible cell line recapitulates in situ developmental changes in prestin's Boltzmann characteristics and reveals early maturational events. Am J Physiol Cell Physiol. 299, C828-C835 (2010). Abe, T., et al. Developmental expression of the outer hair cell motor prestin in the mouse. J Membr Biol. 215, 49-56 (2007). Oliver, D., Fakler, B. Expression density and functional characteristics of the outer hair cell motor protein are regulated during postnatal development in rat. J Physiol. 519 Pt 3, 791-800 (1999). Tsunoo, M., Perlman, H. B. Cochlear Oxygen Tension: Relation to Blood Flow and Function. Acta Otolaryngol. 59, 437-450 (1965).